Creating the perfect meal starts with the right recipes. 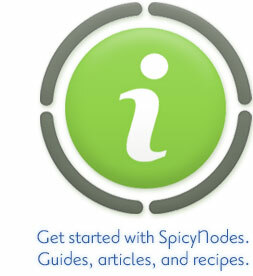 As you experiment with our beta version of SpicyNodes, find the guide or article that fits your needs. If you’re an educator and want to further engage your students, consult our Guide for Teachers. If you’re ready to integrate SpicyNodes into programs, web applications, and mashups, our Developer’s Guide will help you tap into your creativity. Curious about the algorithms that give SpicyNodes its features? Learn about our unique twist on radial mapping in our Reference Section.